The Minnesota Orchestra and St. Paul Chamber Orchestra’s musicians’ contracts both expire on September 30, and a lot hangs in the balance. Despite the nearness of this important date, I haven’t been able to find a decent up-to-date compendium of information about the discussions. I wasn’t going to blog about the situation myself beyond what I already have, for the simple reason I find the subject matter sad. But after the Minnesota Orchestra’s Inside the Classics blog was suspended (or ended, or put on hold, or whatever the crap it was) a few days ago, I got more than sad; I got pissed, and I decided I might as well channel that pissedness into something semi-useful. I had some spare time, and I figured I could at least assemble some links for people so they can read up on the situation without having to compulsively stalk Google News. Everything I write here will be based solely on what has already been said in blog entries, interviews, newspaper articles, etc. There will be no gossip here – no secrets – no “I heard from such and such who said that such and such said such” – no unnamed sources – no scoops: just information that is already publicly available to anyone with an Internet connection. Work by other writers who use any of the above methods of information-gathering will be promptly ignored, because that’s just not my style. You guys can use Google Blogsearch if you really want to read that kind of stuff (although I’m not sure why you’d want to). Before we begin, keep in mind I’m not a journalist, or a union drone, or an arts administrator. I’m just a blogger, a freelance violinist and violist, and a patron of both the SPCO and the Minnesota Orchestra. I have an instinctive sympathy for professional musicians. I want both orchestras to continue to perform at the highest possible level, and for the long-term. And as I’ve mentioned in this blog before, I have professional and personal connections with people who are in both ensembles. So yes, I will do my best to be fair, but no, I will not be neutral. If you feel this renders what I have to say irrelevant, feel free to stop reading. I’m planning on doing one entry a week, with each entry being updated as many times as I deem necessary throughout the course of the week. That way I won’t spam you with dozens of short updates. Visit daily if you want to see the most recent stuff. Or, if you patronize violinist.com, as I know some of you do, keep an eye out for updates, as I’m also planning to post them there, too. Remember, even if you’re not in the Twin Cities, you can help by liking the Musicians of the SPCO and Musicians of the Minnesota Orchestra on Facebook. Doing so will keep you up-to-date on what’s happening and give you suggestions for how to help. Here’s to speedy, satisfactory resolutions for both organizations. Love you guys. The St. Paul Chamber Orchestra (SPCO) and Minnesota Orchestra are currently in the process of re-negotiating their musicians’ contracts, both of which (coincidentally) expire on September 30. In the next few weeks (and possibly beyond…) there will be a lot of news coming fast and heavy from all four sides. What’s happening in the Twin Cities has the potential to become a national story, and y’all really should keep an eye on us to see what our orchestras and our communities do right…or wrong. I’m keeping a running entry here discussing what is going on from my perspective as both an SPCO and Minnesota Orchestra patron and music blogger. Anyone with additional thoughts or news, please chime in. To start, Minnesota Public Radio ran a primer on the situation here. On August 28, MPR ran a story about various SPCO musicians heading to the Minnesota State Fair to share their talents and spread awareness of the situation to the public. In this article, SPCO Interim President Dobson West is quoted as saying, “I don’t know how they arrived at those numbers, but they are not correct numbers. We have never proposed that kind of a magnitude of a cut.” I’ve been unable to find an interview in which Mr. West discusses (what he feels are) the correct numbers. When he does make them public, I’ll post a link to them here. That same day, the musicians of the SPCO released a PDF summary of the negotiations so far. You can read that here. This document discusses some eyebrow-raising changes to insurance, tenure procedures, seniority pay, sub compensation, etc. Go read it. It’s…pretty depressing. Cue up some happy, triumphant music to listen to afterward; you’ll likely need it. We’ve heard comparatively little coming out of Minneapolis this week, but my gut tells me that’s likely to change within the next few days, as musicians and management are meeting today (August 30). The Minnesota Orchestra blog is (um, was) written by a violist (Sam) and the principal pops conductor (Sarah); they co-host the Orchestra’s Inside the Classics series. Clearly there was no serious discussion about the cessation of the blog with either of them. There were no good-byes, and no hint of an impending ending or break in previous entries. The author of the Truly Bizarre Post is not Sam or Sarah, but rather a shadowy figure, heretofore unknown, named “admin”. Don’t let the excuse that they’re busy planning the upcoming season fool you: the Inside the Classics series has been going on for years now, and both Sam and Sarah are consummate professionals who are fully capable of updating a blog and planning a concert series at the same time. I can literally think of no credible reason why this happened. (Someone is scared they’ll write a pro-musician entry? Someone doesn’t want the public asking questions about the negotiations in the comments section? An escaped enraged zoo monkey came into the Orchestra’s offices and started slapping on a keyboard and miraculously typed those exact words and then by accident clicked post?) And “admin” is going to blame the blog’s break – or whatever it is – on Sam and Sarah’s implied inability to balance both, when they’ve balanced both for years? Really? … As my best friend says, “LAAAAYAME!” If whoever is behind this entry is going to lie so transparently, he or she could at least do us the favor of lying entertainingly. How about telling us how Sam and Sarah are going on an exciting African safari for the next six months? As a music blogger myself, this really annoys me. (Clearly.) I can’t think of two better bloggers on orchestral culture, and it just seems the height of stupidity and irresponsibility to kick those articulate voices to the curb, presumably with no warning. Hey, Minnesota Orchestra, if you’re trying to foster good-will with your public, here’s a news flash: you’re failing. Miserably. First off, a welcome to my new blog readers. Hello! This article spread like influenza; night before last I laid in bed with my laptop until one in the morning, repeatedly clicking refresh on my stats page, shocked at the numbers I was seeing. (You guys stay up late!) There is clearly a real thirst to know more about what’s happening. Hopefully this interest is a sign of how beloved these two orchestras are. Like I said above, please feel free to comment here and engage in a dialogue. I approve all blog comments that aren’t spam, no matter how violently you disagree with what I’m doing. Look in the comment section for proof of that. I forgot to mention in my last entry that on August 27 MPR put out an article with the provocative title, “Do the Twin Cities need 2 orchestras?” Upon reading that question, angry defensive heartburn ensued. However, despite the tone of the headline, it actually turned out to be a pretty pro-orchestra article, and draws the conclusion that yeah, two orchestras are cool…and even necessary. Thanks for the coverage, MPR, but please don’t use skeptical headlines like that again, or I might be tempted to fling back the question: “Do the Twin Cities need 2 sports teams?” And that would not be a classy move on my part. The organization MN2020 put out a pointed editorial called “Sour Notes” drawing parallels between the SPCO’s situation and the exciting national pastime of union-bashing. Regardless of your opinion of the author’s politically progressive viewpoint, I think we can all agree on its closing line: “Mediocrity yields no rewards.” Artistic…or fiscal. There’s not much to report from the other side of the river. Today the Minnesota Orchestra musicians posted a blog entry describing the latest talks with management. Here is the entirety of the entry: “On August 30 and 31, the Musicians met with the board and management in two sessions totaling 5 hours. The parties continued to discuss both artistic and financial issues, and agreed to meet again in September.” End entry. This is by far the vaguest report we’ve gotten yet. I was interested to see the talks apparently extended to August 31; last I heard they’d only been scheduled for August 30. Read into that what you will. Over the last week, the musicians of the SPCO and the musicians of the Minnesota Orchestra have taken markedly different approaches to the PR battle. The SPCO has been blogging, posting on Facebook, writing editorials, soliciting testimonials, giving interviews…while the Minnesota musicians have been almost totally silent. The differences in approach are striking, and it will be interesting to watch how they play out in the upcoming weeks. SPCO bassoonist Carole Mason-Smith gave interviews to progressive radio hosts Nancy Nelson on August 30 and Jack Rice on September 2. You can listen to the interview with Nelson here (Ms. Mason-Smith’s interview begins at 44:30, after Nelson gives an amusingly stereotypical liberal apology for shouting her guest down in a previous segment…it’s like a real-life version of Russ Lieber from The Colbert Report!). The interview with Rice starts here (at 29:00). Personally, although I’m unabashedly liberal and likely agree with the majority of their opinions, I’m not a tremendous fan of either Nelson or Rice’s interviewing styles…although of the two, Rice elicits the more enlightening conversation by far. Keep in mind if you’re politically conservative, or in any way sympathetic to management’s positions, your mileage may vary with these interviews. However, despite any Olbermann-esque tendencies on behalf of the hosts, Carole Mason-Smith was a brilliant, lovely, level-headed surrogate for the SPCO musicians. Kudos to her. She also recently appeared in this lovely little interview with Fox 9. If you watch it, you can see some Telemann! As an outside observer, I do have to say that the SPCO musicians have really kicked management’s butts in the PR battle over the last couple of weeks. In interview after interview after interview, the conflict has been framed almost exclusively in pro-musician terms, and management has done hardly anything to push back against that narrative…save for Dobson West’s brief (and confusing) interview with MinnPost on Friday. Do they not think they need to win an argument in the court of public opinion? – are they still formulating a strategy of their own to communicate their vision? – do they not have a vision? – are they waiting until we get closer to September 30 to discuss these things? If they are waiting until closer to the deadline to speak, why don’t they say so? At this point your guess is as good as mine. But the silence is deafening. And very weird. On September 1, conductor and SPCO artistic partner Edo de Waart gave an interview in the Minneapolis Star Tribune, discussing his upcoming concerts with the SPCO. He was asked, “Are you following the contract issues at SPCO?” He responded with a simply lovely sentiment: “If you ask me this question in two weeks, I would say yes. Since I’m only a partner, I do not inject myself into it. My point of view is this: If a country with 350 million people that prides itself as one of the greatest countries that ever was can’t sustain a 35-piece full-time chamber orchestra, the only one in that country, that’s really shameful. I’m not blaming anybody, but there should be a way that can exist. This is a jewel. It’s a beautiful little orchestra. It cannot, in my view, it should not be made smaller and it needs to keep its competitive edge by attracting the best players by paying a decent salary.” This is a simply beautiful summation of what I feel in my heart, and I thank the maestro for verbalizing it. That same day, the SPCO musicians released a collection of charts discussing their salaries and such, the detail of which would make the graph-obsessed Paul Ryan proud. I am notoriously math-impaired so I’m not going to comment on them, but if you want to delve into the numerical geekery yourself, click here. We’ve heard nothing new from Minneapolis besides what I wrote yesterday. In the absence of news, we send the organization our thoughts and best wishes. According to the Minneapolis Star Tribune, the musicians of the Minnesota Orchestra will put on a free concert at the Lake Harriet Bandshell on September 16 at 4pm. Instead of relying on the Minnesota Orchestra to organize the show, the musicians are doing it all themselves. Courtesy of an unfortunate sentence fragment, it’s unclear who the conductor is, but it seems to be bass player William Schrickel. Banished “Inside the Classics” blogger / orchestra violist Sam Bergman will serve as host. The Minnesota Orchestra Musicians’ website says the Lake Harriet Bandshell concert used to be an annual tradition, but it hasn’t been observed since 2007. So it’s very, very cool they’re bringing it back this year. The program includes work by Beethoven, Dvorak, Williams, and Heitzig, among others. You should go! In other Minneapolis news, public radio personality Marianne Combs re-posted a link to the “Do the Twin Cities need 2 orchestras?” article from last week. There’s no new information in Combs’s post, but you might want to follow the comments, if only to take the pulse of the public radio crowd. This is a link that came in a September 4 email to SPCO patrons from the interim CEO Dobson West. I have not found this site in my (literally) hours of reading about this conflict. I am not sure when it went live. It has never appeared on a Google News search or a Google Blogsearch search. It also – as best as I can tell – is not linked from the SPCO website. No media outlet has yet acknowledged its existence. We’ll see if reporters pick up the story today or tomorrow. There’s enough information here to keep a journalist busy for days. Highlights include a Pioneer Press editorial co-written by Dobson West on September 1 (why did this not appear with a Google News search? why haven’t any other websites or newspapers picked it up? ), summaries of negotiations from management’s perspective, and letters between attorneys. And that’s just touching the surface. There is a lot of stuff here. I won’t be able to offer the context and perspective that this chunk of information deserves. I’m too young and have no experience in arts administration. So, hey, American arts journalists and bloggers and anyone who can translate this stuff into plain English and doesn’t have an ideological ax to grind: Listen the crap up. I’m likely naive in hoping for this, but it is really time for you guys to step up to the plate. This is not a time to imitate the vapidity, commercialism, and false equivalences of a 24-hour news network. This is the time for some serious hard-hitting journalism. A lot is at stake. And these stories are not adding up. Once I’ve had time to process these very dense documents, and check them against the documents the SPCO musicians have made available, I’ll offer some thoughts and questions from my perspective as a patron. 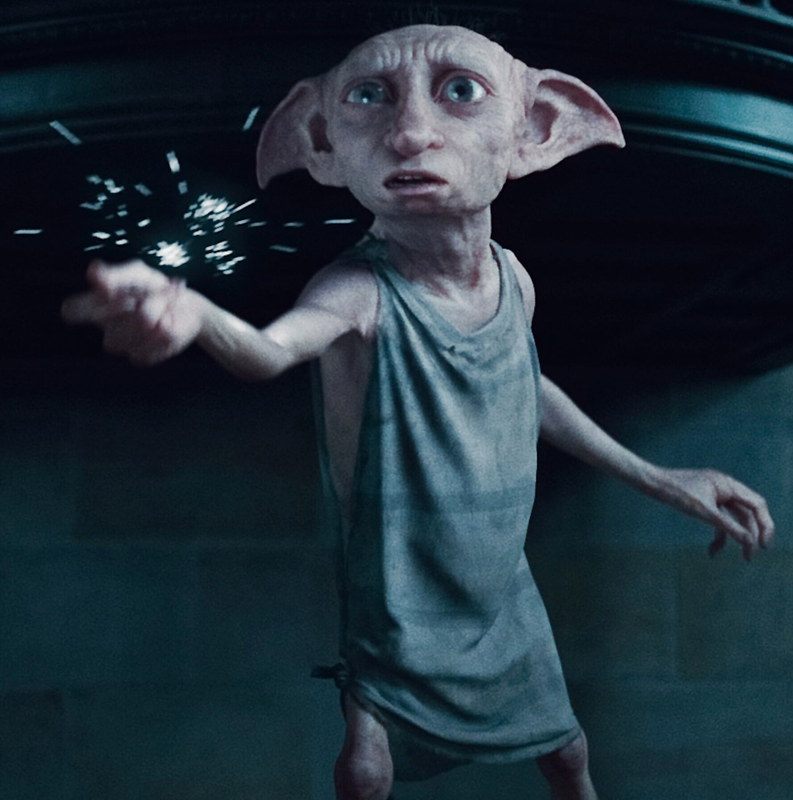 As a totally off-topic nitpick, am I the only one who is really turned off by the way that West signs his letters to SPCO board and musicians as “Dobby”? Has he never read Harry Potter? This is not a character you want people to think of when they read your name in a business setting. In a conversation as important as this, every word counts, every word makes an impression. Best to come across as professionally as possible with a full name, and not risk associating yourself with an obsequious house-elf with Dark Wizard masters. Yes, this complaint may be illogical. But on the other hand, illogical first impressions very quickly add up to an opinion. As always, feel free to share what you think here. Below I’ve reproduced the email that my reader “St. Olaf Musicians” says was sent out to SPCO patrons yesterday. I want to take this opportunity to welcome you to The Saint Paul Chamber Orchestra’s 2012-13 season. Our season kicks off with a free concert at 7pm this Thursday night in Saint Paul’s beautiful Mears Park as part of the Concrete and Grass Music Festival. On Friday, Saturday and Sunday, Artistic Partner Edo de Waart joins us for a program featuring Stravinsky’s Concerto for Strings and Octet for Winds alongside Beethoven’s grand Eroica Symphony. The following weekend we welcome two Artistic Partners to the stage when Edo de Waart and Christian Zacharias join the orchestra for Brahms’ magnificent Second Piano Concerto alongside two of Strauss’s finest works, the Opus 7 Serenade for Winds and Metamorphosen. We hope you have the opportunity to join us for these great season-opening programs. We’re proud to announce that more than 2,500 people have now joined our SPCO Membership program. SPCO Members can attend unlimited SPCO concerts for only $5 per month. We’re especially pleased to see that a significant number of brand new audience members have joined us through this program. In addition to our affordable new Membership program, our regular ticket prices are also affordable at only $10, $25 or $40 each. Low prices are part of our commitment to being accessible to the broadest possible audience. As a result of our accessibility efforts, our annual attendance has increased by over 20,000 over the last decade. What’s more, we’ve been able to significantly reduce our marketing expenses, so that we are now generating more net revenue than we were with higher ticket prices. We’re delighted that what makes good sense for our mission has also proven to be a financial success. In the midst of the excitement surrounding the start of our new season, you may also have heard that the SPCO and its musicians’ union are in the process of negotiating a new contract, as the current contract expires on September 30. The SPCO, like many orchestras across the country, faces a challenging financial situation due to long-term changes in the arts funding landscape, exacerbated by the economic downturn. We’ve done much to avoid deficits in recent years through aggressive expense reduction on the administrative side of the budget, having eliminated over $1.5 million in annual expenses since 2008, including reducing the size of the staff by 17%. However, the work we’ve done to date has not been sufficient to solve our financial challenge, and we will have a deficit of up to $1 million for the fiscal year that ended in June. If nothing changes, we will face even larger deficits in the years to come. Our future health and vitality is dependent on aligning our expenses with our predictable, sustainable revenues. Musicians’ salaries and benefits comprise the single largest expense item in the SPCO budget and we are now looking for the contract to be a part of the solution. It is our sincere hope to work as collaborators with our musicians in solving this challenge. We value our musicians’ considerable talents, training and dedication, and we are confident that by working together we can develop a solution that ensures the SPCO is both financially sustainable and artistically vibrant. There have been some rumors circulating about what the SPCO Board and Management intend to accomplish through these negotiations, so I’d like to take this opportunity to set the record straight. The SPCO does not intend to reduce the number of orchestra concerts we offer to this community. We do not intend to cut musician compensation in half, create a part-time orchestra or move to a freelance model. We are committed to having a chamber orchestra of the highest caliber in this community for years to come, but we will only be able to accomplish this if we have a contract that we can afford. As the season begins, it’s likely that our contract negotiations will become a more prominent part of the public discussion. If at any point you have questions about what you are hearing, we invite you to contact us directly. We will continue to provide you with updates as there is news to share, and you may also visit our negotiations updates webpage at thespco.org/contract. Meanwhile, enjoy the start of the 2012-13 season! And if you’d like to enjoy even more SPCO music in the comfort of your own home (or on your iPhone or iPad), we invite you to visit our Listening Library at thespco.org/music, where you’ll find more than 250 full-length SPCO recordings available for free listening. Thank you for supporting the SPCO. Now more than ever, we’re extremely grateful for the support from our audience members and generous contributors. We look forward to seeing you this season. This isn’t going to end well, is it? The Minnesota Orchestra management has launched a new website discussing the conflict from management’s POV. You can find that here. It’s loaded with as much information as the SPCO’s new pro-management website is. The centerpiece of the website is management’s proposal. According to this MPR article, under this proposal, “the average wage of a musician in the orchestra” will drop from $135,000 to $89,000. The Minneapolis Star Tribune says, “The average base salary of a musician would fall to $78,000 from a current level of $109,000.” “Average wage” and “average base salary”: those are important distinctions to keep in mind as you follow this story. It’s comforting to hear that MPR is on this. Their coverage of “Orchestral Apocalypse ‘012” has consistently outshone the Pioneer Press and Star Tribune’s. If you only have time to follow the coverage of one media outlet, follow MPR. The Star Tribune also is on the SPCO story that I posted about earlier today. Not much new information in that article, though. It’s times like these that one wishes instantaneous cloning was possible. One brain is simply not enough. These kinds of discussions would be confusing enough with just one orchestra, but then when you have two going through basically the same thing at the same time in the same metro area…it becomes mind-bending. And the cynical part of me wonders if management wanted it this way. Do you think it was coincidence that both orchestras released the exact same kind of data within twenty-four hours of one another, after clearly spending a long time assembling it, and very possibly a long time sitting on it? Are the orchestras’ managements coordinating in any way? If so, how? For that matter, are the orchestras’ musicians coordinating in any way? If so, how? I wonder. Is anyone else reading through these dozens and dozens of pages? What are you noticing? What are you thinking? What are you feeling? Anyone up for a group therapy session? Anyone wanting to get drunk yet? I don’t even drink and I want to get drunk. Badly. All the analysis I have to offer right now is that this is sad, and I’m sad. I’ve been steeling myself for this conflict for months, but…it’s still sad. The bombshell of the morning is that the Musicians of the Minnesota Orchestra are claiming that management went public with its proposal without telling the musicians they were going to do so (if I’m understanding correctly). I don’t really know what to say to that, but here’s the most recent Musicians of the Minnesota Orchestra blog entry. And here’s a Star Tribune article about what happened. Lots and lots and lots of questions here. What kind of warning did management give to musicians before making the contract public? If they didn’t give any warning, why not? Because going public without telling the musicians beforehand seems…unnecessarily dickish. (Kind of like shutting down the Inside the Classics blog without telling its authors. Sorry, but I’m still bitter about that one.) Is it true there were no counter-proposals from musicians? If so, why? The musicians say that two years ago management rejected $1.5 million in concessions from musicians. What’s the story behind that? We desperately need someone to cut through all this spin. One thing I’m seeing a lot of on various blogs and newspapers is analysis of salary cuts, with only brief mentions here and there of the proposed changes to working conditions. Call me crazy, but I’m not convinced that the salary cut is the most important thing at stake here. Yes, a 25% pay cut makes a big flashy exciting headline. It entices people to click on links and take umbrage. But I’m guessing the musicians consider the myriad of other changes within the contract to be the bigger issue. As trombonist Doug Wright says in the Star Tribune this morning, “…They are trying to erase 40 years of accrued working conditions” (italics mine). Keep an eye on this in the coming weeks; remember this is not just a battle over salary and numbers. The musicians believe they are fighting for not just a world-class salary, but world-class working conditions that will attract – and retain – world-class talent. They claim that many will seek work elsewhere if the proposals are enacted, and unfortunately, it seems they have a legitimate concern: look at the number of musicians who left the orchestra just within the last season alone. And according to the Minnesota Orchestra Musicians’ website, for what that’s worth: “The Minnesota Orchestra has an unprecedented number of unfilled positions at this time – more than 10% of the orchestra. The Musicians are deeply concerned that there are no auditions planned at this time to fill any of the vacancies.” One important question that will help you decide where you stand: do you think the musicians are bluffing when they say that many of them will quit if management’s proposals are enacted? I have the advantage of knowing some of these musicians. The ones I know? They aren’t bluffing. Salary is one factor that helps people to determine whether they want to remain in a job. [And the award for “Most Obvious Sentence In The History Of Ever” goes to… Minnesota Orchestra Management! Congratulations!] There are many other factors as well, especially in a mission-driven organization like the Minnesota Orchestra. This orchestra has many great advantages for musicians. The Twin Cities are a terrific place to live, with a cost of living lower than in many other cities where top orchestras are located. And the Minnesota Orchestra has a great artistic profile because our board, music director and management are committed to ensuring that our organization continues to tour, make recordings and engage in artistically significant projects. [Yeah, musicians: what have you done lately to raise the orchestra’s artistic profile? Pffff.] This positively impacts the daily lives of Minnesota Orchestra musicians. So, if I’m reading that right: “well, the Twin Cities are awesome, and we’re still going to let our musicians tour and record and stuff, so despite unpopular wide-reaching changes in their contract, and despite the fact many of them could make more money and have more fulfilling careers elsewhere, we think and hope the musicians will stay”? Hmm, where have I heard phrases about how one should avoid planning for the future based on hope rather than reality lately…(hint: it’s the fourth paragraph down). I’d be grateful if a reporter could ask someone in Minnesota management what their thoughts are about the very real possibility of a mass exodus. What happens if, say, even ten of the musicians leave? (And unfortunately, I can envision a scenario where many more than ten leave…) Is management prepared for such a scenario? How would they feel if such a thing transpired? Would they feel regret? Sadness? Shock? Do they feel that an orchestra full of substitute players will be able to retain the same high artistic standard as full-time players? It seems awfully naive to expect to sustain a world-class orchestra by providing less than world-class wages and working conditions. I’d be so much more comfortable if the powers-that-be openly acknowledge that yes, their proposal may well make people leave, and negatively affect the quality of the orchestra…but that’s what tough economic times call for, and that’s a sacrifice Minnesota is willing to make. I don’t like when political parties earnestly claim we can balance the budget without raising taxes or cutting entitlements. And I don’t like it when a similar tactic is used here. Management may be telling musicians that they can’t eat their cake and have it, too…but neither can management when they paint an unrealistically rosy picture of the orchestra’s artistic future. On a closing note, I want to caution everyone following this story: take nothing, absolutely nothing, at face value. Refuse to trust anyone. (That includes me.) Orchestra contracts are complicated, complicated beasts that are impossible for outsiders to fully understand. If you’re not in the business – and sometimes even when you are in the business – you will not be able to judge the accuracy or implications of what anyone is saying. Period. There will be endless ways to massage numbers, phrases, proposals…especially when negotiations are ongoing, and the terms are (presumably) open to shifting. So take everything that is being said right now with not just a grain of salt, but a f***ing salt mine. And hang tight. Hey guys, are you ready for your daily dose of orchestral acrimony? If so, take an aspirin, pop some popcorn, and gather round! Here’s MPR’s story “Orchestra contract talks a matter of money vs. artistry” and here’s a MinnPost article that briefly discusses the conflict. I love this line in MinnPost: “With current contracts for both the Minnesota Orchestra and the St. Paul Chamber Orchestra set to expire Sept. 30, we’re hearing a lot more than we usually hear from both sides, maybe more than we want.” Take it from someone who has spent hours every day this week attempting to comb through it all: we are hearing more than we want. A lot more. SPCO musicians? As Jon Stewart says…could I see you over at camera three? Okay, unsolicited lecture over. Just…be careful, okay? And work on the assumption that people who are just tuning into this story are going to get tired of both you and management. Quickly. Yes, I too find that calling for risky controversial change and then expressing a flippant doubt to MPR that the risky controversial change might not actually work always serves to highlight a person’s executive competence and leadership abilities! Sorry. I’m falling victim to the same bad temper as everyone else. Sigh. But…camera three time again. Look. Mr. West, the St. Paul Chamber Orchestra is not some kind of non-profit laboratory. There is no “first time.” There is “a one and only time.” If you blow this chance, if you make any mistakes, the SPCO will suffer, and very possibly suffer very badly. However, we all know you won’t need to worry about that, because by the time the worst is over, you likely won’t be here. Because in a few years, if not earlier, you’ll get another job (that is, if you can get hired if you drive the SPCO into the ground, but face it, you probably will). Then I and my Twin Cities friends will get stuck with the task of rebuilding. And that is not cool. So please please please don’t be so flippant. This was a huge misstep on your part, and it would be lovely if you’d apologize, or at the least explain what the h*** you meant. Despite all that, the biggest news of the day comes from the Minnesota musicians, who are requesting “an independent audit of the organization’s finances, including its endowments.” (Star Tribune article here. Question: have the journalists over at the Pioneer Press died? Do we need to send someone over there to check if they’re okay?) The request was made in a letter from chief union negotiator Bruce Simon to Paul Zech, counsel for the orchestra board’s bargaining team. I guess the insinuation is that management is massaging numbers upward to make things look better when they want to fundraise and polish their resumes, and then massaging them downward again when they want sharp concessions from musicians. According to the Star Tribune, management said in a statement, “We’ve answered these questions many times in our negotiations sessions, so we have no specific comment today.” It’s not clear from the article which questions management is referring to, although I’m assuming they concern the state of the endowment. I can’t find the full text of the statement myself, so, um, feel free to speculate as to context. It does strike me as strange that something discussed in negotiation sessions is regarded as something the public doesn’t need to see. I thought we were in a brave new world of transparency in our negotiations? If one side is justified in going public with a proposed contract without telling the other, why would an audit on an endowment be considered unreasonable? Am I missing something very big and very obvious? All I found on management’s website about the endowment was a shiny superficial annual report and strategic plan that says very little, if anything, about what is actually in it. If anyone else knows what, if any, information about the endowment has been made public, let me know. What would the downsides of an independent audit be, besides the expense? It’s not exactly a secret that nobody at the table trusts, respects, or particularly likes each other. So wouldn’t it be a good idea to bring in an independent party to get everyone on the same page? Or am I just hopelessly naive? I need to take a deep breath after that sentence. It hits home more than anything else that has been discussed so far. I’m a freelance violinist and violist. I’m also disabled with a variety of illnesses that leave me in perpetual chronic pain. I’ve had to give up many jobs over the years because of injuries. I understand the physical, mental, emotional agony of a musician unable to play, and I understand it intimately. And so I say with authority: this is not a reduction to be made lightly. If you are not a professional performing musician, you do not understand the potential implications of this reduction. Period. No exceptions. I’d like to know 1) how many people in the orchestra have needed more than 13 weeks of medical leave in, say, the last ten seasons, 2) how many weeks of fully paid medical leave peer orchestras offer, and 3) how much money this measure would save. (Although, on second thought, I don’t trust anyone’s numbers at this point, so maybe point 3 is irrelevant…) If I was in the Minnesota Orchestra, this provision alone very well could be the breaking point that would encourage me to retire or seek more flexible work elsewhere. If it becomes a financial necessity for players to perform through pain and injury, their very careers could be at stake. The consequences of this proposal really cannot be overstated. Something like this makes the salary stuff seem like a side-story. I got a Minnesota Orchestra season brochure in the mail yesterday. I laughed bitterly when I saw it. Given what has transpired over the last few days, I have the feeling that I might just as well tear out the first few pages of that brochure and put them through the shredder. Maybe I will, if only to experience some kind of weird twisted catharsis. Remember oh, I don’t know, maybe about 24 hours ago, when I mentioned that there might be a mass exodus of musicians from the Twin Cities? Exhibit A: the principal clarinetist of the St. Paul Chamber Orchestra, who has been with the group since 1977, has submitted his letter of resignation. Dear managements: How many players will have to leave before you admit your plans may be having an adverse effect on retaining and attracting world-class musicians? I’d like two hard numbers, please: the number of musicians you think will leave by the end of the 2012-13 season, and the number you think would indicate we have a problem. That would be awesome. Thanks. I continue my blogging on this entry. So feel free to hop over there. Most of my practice time lately has been spent prepping the forty-odd-page viola part to Mahler 6. I’ve listened to the piece once a day since I learned I’d be playing it, and I’m now wrestling with a very basic question: do I, or do I not, like this music? I listen again and again, trying to discern some kind of narrative in this ninety-minute mass. The first movement begins with a march. It seems to presage the Great War with its grandiose character of pomp, brass, and militaristic pageantry. The grandiosity, however, intimidates more than it inspires. The melodies seep a kind of brave, romantic defiance. They are beautiful at first listen, unnerving at second, and terrifying by twentieth. A strange, listless chorale comes and goes. After five long minutes, just when the thirst for musical violence finally seems to have been quenched, the brutal opening is…repeated. And not just partially so: it is completely, totally, turn-the-score-back-to-the-beginning repeated, with all the strength and savagery of the first go-through. Eventually, a full ten minutes after starting off, we finally move on, but even then the same vicious mood persists for quite a while. After a long protest the music slides into a kind of dreamy moonscape, lit by high tremolo, soft woodwinds, magical celesta. But the dream’s seductive beauty never feels quite right; the memory of that march is always lurking. When the dreamer is awoken, abruptly and without mercy, the militaristic sounds returns, apparently inescapable, inevitable. Things come to a terrifying head at 16:50, when one of the majestic primary themes is twisted in the grandest, most terrifying manner imaginable. As the movement comes to a close, the moods wildly seesaw between heavenly and hellish, wrapping up with a manic, wild-eyed sprint to the finish. At this point, twenty-five minutes into the symphony, an emotional respite would be more than welcome. (Hint, hint, Mr. Mahler.) Chances are, however, you’re not getting one; many conductors opt to move on to the weighty mid-tempo scherzo instead. (I questioned this decision when I first listened to this piece. Surely the slow movement should be put here, I thought, so I can take a breather from that massive introduction! But then when I found out – spoiler alert! – that the last movement was even bigger than the first, I quickly changed my mind.) At first glance the score looks relatively simple…until you realize that every line contains a new rhythmic pitfall with the capability to derail your whole performance. The emphasis hops from first beats to third beats; fourth beats are sprinkled throughout; the tempo yanks back and forth. The only way I’ve found to keep it all half-straight is by screaming “ONE!!! two three ONE!!! two three” in my head in an attempt to ignore that frequently off-balance third (or fourth) beat. Mahler’s wife Alma famously compared the rhythm of this movement to children playing. As you listen, the metaphor seems apt, even charming…until the orchestra’s bows begin playing a spooky col legno passage, conjuring up the image of little clattering skeletons. Well, you might say. Bleak ambiguity only goes so far. Things have to start feeling a little more optimistic in the third movement (at 39:30). Right? Wrong. Here we get a theme that is neither major nor minor, neither happy nor sad, neither hopeful nor hopeless, neither yearning nor satisfied…neither black nor white. The only indisputable thing about it is that it is achingly, impossibly beautiful. So. Apparently Mahler was waiting until the last movement – roughly an hour into the symphony – to express the inevitable heroism, certitude, catharsis, that we’ve come to expect from our monumental symphonic music post-Beethoven. It certainly seems that way when, at the beginning of the final movement, an emphatic line rises from a misty tremolo (55:00). The stage seems set for a grand resolution indeed. However, before long we realize there will be no straightforward Beethovenian triumph. Instead we find ourselves skidding down the rails on a fast, frantic, frenetic ride, clearly uncontrollable (59:00). This is music determined to charge the gates of hell…regardless of the futility of the task. Then the terrifying militaristic percussion from the first movement comes back…as well as the creepy celesta-laced dreamscapes. There are some uncomfortable moments of deja vu. We’ve tread a lot of water in the past ninety minutes, but you have to wonder: have we really gotten anywhere? Then, if you were delusional enough to think you had any idea where this was all going, a percussionist raises a person-sized hammer above their head, and you realize, well, clearly all bets are off. At this point absolutely anything could happen and it wouldn’t be surprising. 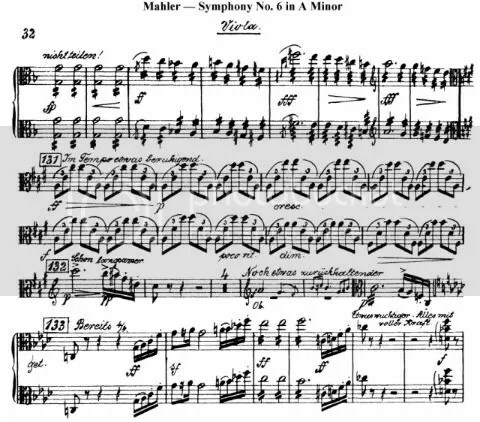 In case you haven’t heard how Mahler 6 wraps up, I’ll save you the surprise and stop there. Next time you have ninety minutes to spare, look it up. Just make sure you’re not suicidal at the time. I’ve read so many conflicting opinions about this symphony. Some feel it’s Mahler’s masterpiece. Others see it as seriously flawed: maybe fatally so. Some find it to be fatally flawed…and yet cite it as their favorite anyway. It is said that Mahler cried at the first rehearsals for it, unable to come to terms with what he’d unleashed. Alma alleged that the hammer blows prophesied the catastrophes that would later shake their marriage. Heck, even now, a hundred plus years after its composition, we can’t even agree about something as fundamental as what order to put the movements in. I imagine I’ll get a dozen comments on this post sharply disagreeing with my opinions, and with everybody else’s. Because that’s just the kind of conflicted reaction this massive music seems to engender. And then throws the envelope into a raging bonfire. “In what way?” she asked. “How don’t you feel well?” she pressed. I thought for a moment. “I don’t know,” I said, and I didn’t. I wished I hadn’t even mentioned it. “Maybe it’s all the Mahler I’ve been playing,” I finally said. I’d said it as a joke. But as soon as the words were out, I realized they had an uncomfortable ring of truth to them, and I frowned. I thought she’d laugh at me, but she didn’t. “That could very well be,” she said, and we both fell quiet for a while. Here’s a post inspired by violinist.com’s challenge “Celebrate Classical Music.” I encourage all my readers to take part! Classical musicians are a unique bunch. Think for a moment about what is required to acquire even a basic competency in the art: a passion for a kind of music that has (at least in certain ways) slipped underground. Perfectionism. Obsessive tendencies. A willingness to be locked in a practice room for hours every day. An ability to postpone gratification. A love of beauty and intellectual rigor. As I was thinking about writing on the subject of why classical music is special, I knew I ought to talk about the music itself…but for whatever reason, I couldn’t stop thinking about the people behind the music. There is the professional string-player who has the same ridiculously rare health problems I have. We went to lunch together once and compared notes. I don’t cry about my illnesses very often, but I wept in that restaurant…with sadness, relief, hopelessness, hopefulness. There is the energetic young conductor who was forced out of town by politics and budget cuts. Before he left, my youth symphony would do anything for him – even take on a Beethoven symphony. I still feel sadness over what our community lost upon his departure. There is the stand partner who always had some hilarious quip that would make me laugh at the most wildly inappropriate times. There is the double amputee who learned how to repair violins so that he could help his wife, a violin teacher, run her shop. He always gave off an aura of quiet, humble determination. There is the globe-trotting soloist who drops into the upper Midwest every year or so, always smiling, never tired, fingers spinning out note after note of sheer perfection. There is the hipster composer who is very possibly the most intelligent man I’ve ever met. The afternoon of the premiere of his first big orchestral work with a major American orchestra, he took time out to chat with me at a Minneapolis Starbucks about Midwestern opera houses, blogs, and Youtube comments, among other things. There is the concert pianist who leapt into my open car window at a stoplight. There is the violinist who was very badly burned in his teens, who defied all sorts of odds and went on to become one of the star players of his generation. There is the violinist who I originally contacted through this site who is one of my best friends. Over the last ten years we’ve talked about music, illnesses, families, boys, money, lack of money: everything. We’ve never actually met. But we will, someday. There is the spitfire of a violinist who, after her first professional orchestral audition, was named concertmaster of the Minnesota Orchestra. There is the cellist who saw a real need for a local beginners’ orchestra. Despite being terrified by the prospect, she started one. (And five years later, it’s not just a beginners’ orchestra anymore!) Now her joy and passion for music is infecting a whole community of players. There is the public radio host who was so amused by the fan letter an awkward eighth-grade girl sent him that he entered into an earnest decade-long correspondence with her. There is the wily violin dealer, who knows exactly what to do and say to make a very poor family commit to a very expensive instrument. There is the young couple who taught at my summer camp: weird, wacky, and oh-so-wonderful. He would stop our groups suddenly and ask each of us in turn, very seriously, if we wore glasses, contacts, or had perfect vision. After we gave our answer, we would be free to continue playing. She told me, “It’s okay to sound like sh*t just as long as you’re trying not to sound like sh*t.” Together they made the summer of my seventeenth birthday full of music and magic, and reinforced the idea that I wanted to spend the rest of my life in music in some capacity. There’s the violist who liked my writing here on v.com, who, the first time we met, didn’t mind my sudden burst of emotion, and let me cry a little on his shoulder. “Crying is okay,” he said. And this is only a tiny, tiny sampling of the people I’ve met. There have been many more. So many more. Music by itself is cool, I guess. Fun. Entertaining. Diverting. I’d still play even if I was stranded on a desert island, if only for the intellectual exercise. But, in my experience, music only fulfills its highest potential when intellectual exercise is paired with a sense of human connection. When there’s a duet partner across the room. When you’re debating the nuances of a performance with an educated friend. When your teacher is leaning over the stand erasing some marks and singing to himself. When someone on stage is speaking, only she’s not using any words. When you’re in an orchestra and the horns are blaring and there’s a big scale bubbling up from beneath you in the cellos and violas and you’re furiously following the notes on the stand and scrubbing away with your bow and oh my God page turn coming up quick quick hurry and it’s impossible to make eye contact with anyone else…yet you just know everyone is feeling just as electrified as you are. I think that’s why I find classical music so fulfilling: because the field attracts the most diverse, the most fascinating, the most interesting group of people. And I love making connections with diverse, fascinating, interesting people. I refuse to think about what a husk of a thing my life would be without classical music, and by extension, them. Sometimes you can get rich without having any money at all. Well, my visit to Violaland has officially come to an end. Or at the least, buying a second house there and commuting back and forth between Violaland and Violinland. Or whatever the metaphorical equivalent to taking an audition on viola and then winning it is. This October we play Mahler 6. Well, that’s one way to learn alto clef. And so on and so forth. For forty pages. Now, if you don’t mind, I should probably go. Because I really need to practice.